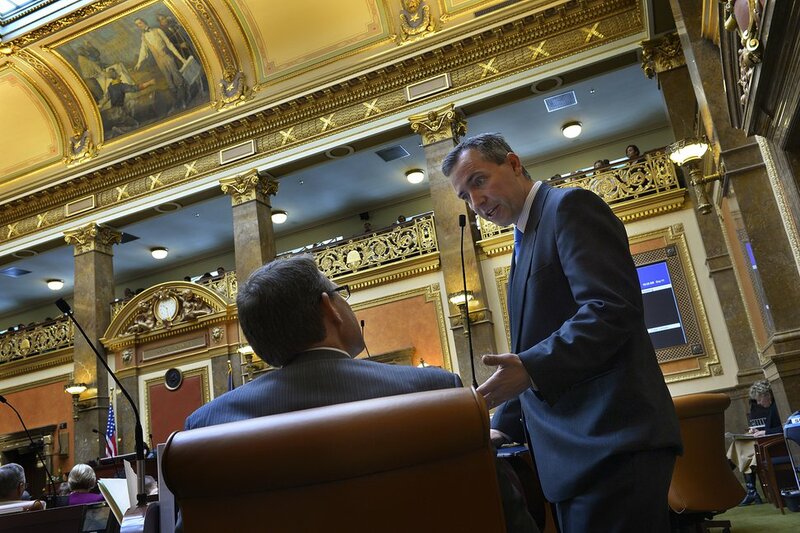 (Francisco Kjolseth | Tribune file photo) Rep. Brian King, D-Salt Lake, speaks with House speaker Greg Hughes as Hughe's wife Krista listens in. The Legislature called itself into special session to attempt to override Gov. Gary Herbert's vetoes of two bills. Sen. Daniel Thatcher has lodged a criminal complaint against the top-ranking Democrat in the Utah House for an alleged assault. Thatcher, R-West Valley City, says he and House Minority Leader Brian King, D-Salt Lake City, got in a physical altercation last month in a hallway in the Senate building at the Utah Capitol after a verbal exchange in a parking lot earlier that day. (Rick Egan | Tribune file photo) State Sen. Daniel Thatcher speaks during a news conference about the National Suicide Prevention Hotline Improvement Act being signed into law. Aug. 21, 2018. In a witness statement provided to the Utah Highway Patrol and shared with The Salt Lake Tribune, he said Thatcher had spoken “angrily” to him in the middle of the election season because he was unwilling to support the Republican’s re-election campaign. King naturally supported Thatcher’s Democratic challenger, Clare Collard, who lost her election bid Tuesday in Senate District 12. King was also up for re-election this cycle but ran uncontested. Afterward, King said he “immediately” realized he had been overly aggressive and worked to make amends, reaching out multiple times over text to defuse the situation. Thatcher tells a different story, saying King has denied responsibility for the incident and that after he spent a week trying unsuccessfully to resolve the issue through human resources, he decided to file the police report. King says he was never contacted by anyone from human resources. “I’m disappointed this escalated to this point when I think I made a mistake, I owned up to it almost immediately and said I was sorry,” said King, an attorney who has served in the Legislature since 2009. Salt Lake County District Attorney Sim Gill, a Democrat, confirmed the case had made it to his office and said that because of his previous relationship with both lawmakers, he has reached out to a “sister jurisdiction” that will consider whether to file charges. The other reason Thatcher said he decided to report the incident to police was because he contends the House minority leader has been aggressive with other lawmakers in the past. “There is a pattern of aggressive and threatening behavior from Representative King,” he added, referencing an altercation he said occurred between King and Rep. Dan McCay, R-Riverton. McCay, a senator-elect reached for comment on Friday, confirmed that King had punched him on the arm on the House floor about three years ago over a difference of opinion on a political issue. But he said he didn’t think about it much afterward, chalking it up to the high tensions and exhaustion that come during the legislative session. (Scott Sommerdorf | Tribune file photo) Rep. Dan McCay, R-Riverton, speaks with Rep. Brad Last, R-Hurricane, on the floor of the House of Representatives, Feb. 6, 2014. “I think [King is] a passionate guy who feels really strongly about what he’s doing and how he wants to represent his district and, you know, in that situation he let his passion get a little more physically expressive than I would prefer,” McCay said. “Brian’s not the first and probably not the last who’s wanted to hit me for one reason or another,” he added. 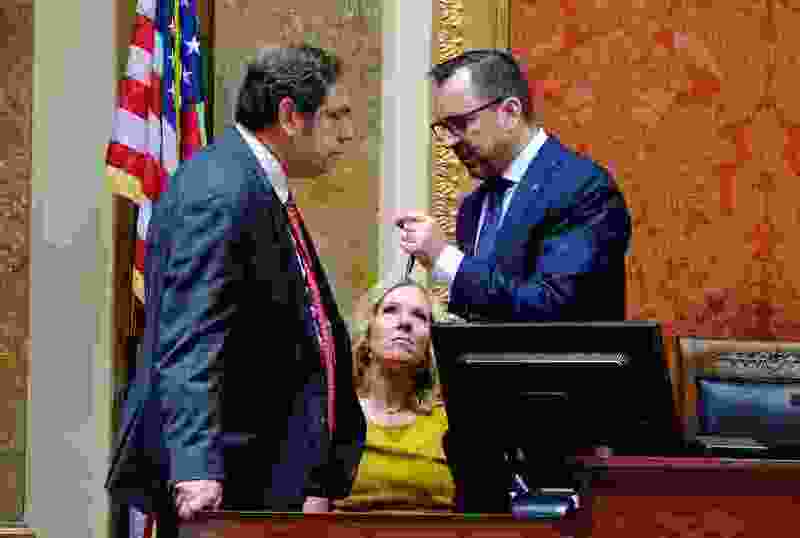 In one other instance of aggressive behavior, Rep. Jim Dunnigan said Saturday that when he was majority leader in 2016 he broke up a loud and aggressive argument between King and Rep. Mike Noel, R-Kanab, on the House floor during debate. Dunnigan, R-Taylorsville, doesn’t know who started the verbal combat or what the issue was. 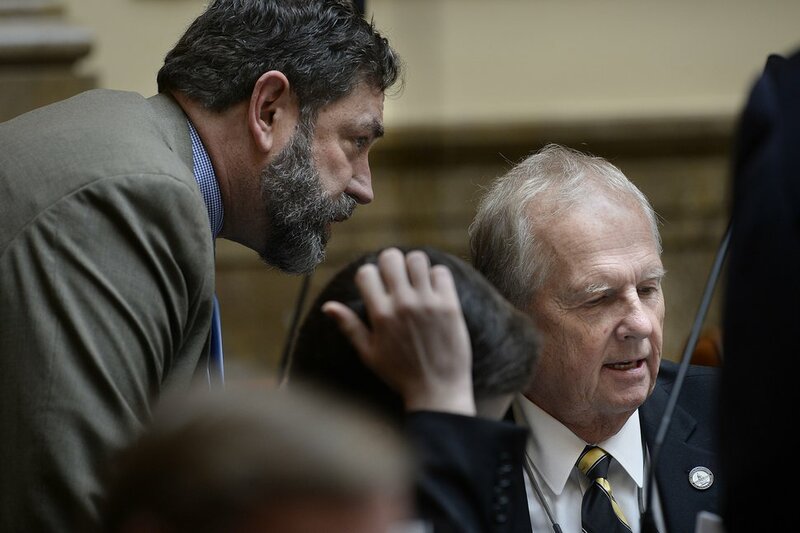 (Scott Sommerdorf | Tribune file photo) Rep. Brian King, Minority Leader, D-Salt Lake City, went to go speak with Rep. Mike Noel, R-Kanab in the Utah House of Representatives, February 22, 2017. When he asked King to back off, he did so, Dunnigan said. He declined comment on whether he believed the Democrat has exhibited a pattern of overly aggressive behavior. King said Friday he was disappointed that the issue with Thatcher had escalated to a criminal investigation and worried it would further diminish the public’s faith in the Legislature. Thatcher, too, expressed concern that the incident would widen partisan divides. Tribune news editor Dan Harrie contributed to this report.